Since Greek imaginations were unchecked, it is possible to see a nymph, a mystical creature like a Minotaur in a cave, or even catch a glimpse of a winged horse. And gods, oh, the Greeks knew where to place their gods and they were also knowledgeable about what the deities ate and drank, and how they partied and amused themselves. Gods were powerful and feared but they could still have foibles: Hera the jealous wife, made crazier still by Zeus—a husband rife with love affairs and follies! Researchers believe that the development of tragic dialogue may have dipped into the gene pool of what was dramatic reciting—and the men who traveled and shared epic poems (rhapsodes) were called bards or “song-stitchers." As far as the choral part, it all reached its most significant form in the city of Athens around 5th century BC. In fact, extant or surviving Greek tragedy occupies a brief period of history, from 480 BC to the end of the fifth century. So, it would have started with Aeschylus’s early plays and ended with Sophocles and Euripides. The most acclaimed Greek tragedians are Aeschylus, Sophocles and Euripides. At the source of Greek tragedy is theatre and the source of good tragic stories is grief. In fact, there are thirteen nouns in Attic Greek (sometimes called Attic tragedy) that describe lamentations—the act of expressing or lamenting grief. Scholars think it might have had to do originally with ancient rites, a kind of ceremony to honor Dionysus, the god of wine, ritual madness, theatre and religious ecstasy. In the theatre, tragedy is not merely a misfortune, something outside our control. It basically shows us how we collude with the calamity that befalls us; so, in other words, it involves some complicity on our part that the disaster will destroy us. It is often said, “To disavow the past is to be destroyed by it." This drama delivered in poetic narrative is often based on a person who has foibles, and they may have made some error or a fatal misjudgment, called Hamartia, and the result is both suffering and insight from the protagonist that makes the audience feel both pity and fear. 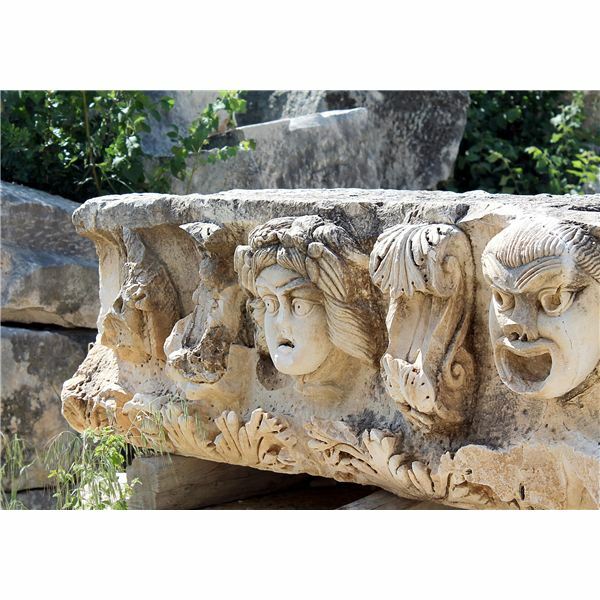 Greek tragic theatre was written by men, performed by men and attended by men. A distinct element is that they hear or see something and disregard it to their misfortune or peril. Interesting point is that many of these men had been warriors; they experienced war whether it was the Greco-Persian Wars or the Peloponnesian War, etc., and it affected them. Many of these plays were held at wine festivals and were a competition between three playwrights. The words “protagonist" and “antagonist" were actually words to describe first and second place writers, not characters; it now means the principal character –the chief actor– and their nemesis. Since many of the theatres are landmarks and still preserved, we can surmise that the general structure is a semicircle. The theatron (“seeing place"), the seating area had either bleachers or stone steps; it also had an orchestra, a flat area where the chorus performed, and the altar of Dionysus at the center. The stage part might have been a covered section and the actors entered through central doors. Later, a skene or dressing place where actors prepared (usually by wearing masks made of linen with hair attached) was added. A wheeled trolley might have brought in the tableaux—this is where participants establish the scene by making still images with their bodies. (See: reference below.) The chorus, and integral part of the play may have entered on a walkway on each side. History tells us the theatrics were sometimes very special. In Aeschylus’ productions he utilized ghosts as characters. Did children faint and women miscarriage that the sight of the Furies (goddesses of vengeance and retribution)? Doubtful, but it does point up the dramatically. There were painted scenes, some owe that to Sophocles, and there could be stage props and equipment for thunder and lighting effects, and even a crane to allow a character god flight called “the god in the machine" or deus ex machina. It would begin with a choral group, usually twelve to fifteen singers. Music in the beginning was typically a flute. Toward the end of the fifth century, it evolved to also have a solo actor and sometimes “responders" or what one might call, interpreters. There were typically five scenes, all pity and fear to catharsis, divided by the choral odes called stasima or there was an alteration between stage and song. The whole feature is proceeded by a Prologue, which establishes context and provides background details and is followed by an Epilogue a literary devise that gives closure to a work where the author steps in and speaks directly to the audience.